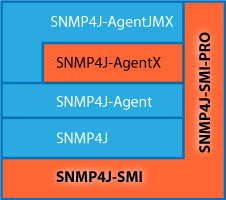 The SNMP4J-SMI-PRO API (and SNMP4J-SMI for personal use) provide MIB compiler support for SNMP4J with seamless integration into SNMP4J and all additional APIs. SMI v1 and v2 MIB compiler with strict (= standard conform syntax checking) and very lenient checking. Format object identifiers (OIDs) used in SNMP4J and dependent applications as object name and index value string when OID.toString() is called. Create object identifiers (OIDs) from object names instead of dotted number format (e.g., 'sysDescr.0' instead '1.3.6.1.2.1.1.1.0'). Compile MIBs into a compressed MIB repository for fast MIB access. Load MIBs into a SNMP4J application from a MIB repository. Compile and use PIB modules.